Disclaimer: It’s up to you to check measurements, components, prices, etc. before you order, build or install this cabinet. I’m just relaying what we did. It may or may not suit your needs. OK, with that out of the way, here we go. So long as you can cut wood to size and assemble Ikea furniture, you should be fine. Let us know in the comments if you have any questions. The cabinet frame is made from 1″ 80/20 aluminum extrusions. This stuff is amazing and comes in multiple different sizes, a couple of different colors, and with many fixing options. We chose the black anodize finish. You could equally well go with the “silver” color of the basic extrusions. It’s still anodized, but clear rather than black. You could also, if you really wanted to, use 1/4 round pieces on the front corners. These are curved and look pretty nice. We chose to use extrusions without t-slots all the way around. We wanted a closed-off look for the aluminum. Our cabinet only has t-slots where the wood panels slide in and where they are needed for fixing the 80/20 together. The extrusion with the slots all the way around is cheaper, though. We also chose to use anchor fasteners (#3395) to clip the extrusions together. They are relatively strong, don’t get in the way of the wood panels we slid in to the frame, and don’t involve drilling holes in the visible faces of the 80/20 profiles. We ordered all the pieces of aluminum cut to length and pre-drilled for the anchor fasteners. This adds quite a lot to the cost, but it saved us a bunch of time during the fabrication process and was a lot cleaner than we could have cut at home. Also, the black anodize finish is added after the pieces are cut so they’re black on the ends and in the milled holes. All of these are choices that you can make. There are cheaper alternatives that you can research on the 80/20 site. As you can see, the 3395 anchor fasteners are not cheap. The counterbore machining for the fasteners costs $2.25 per hole. 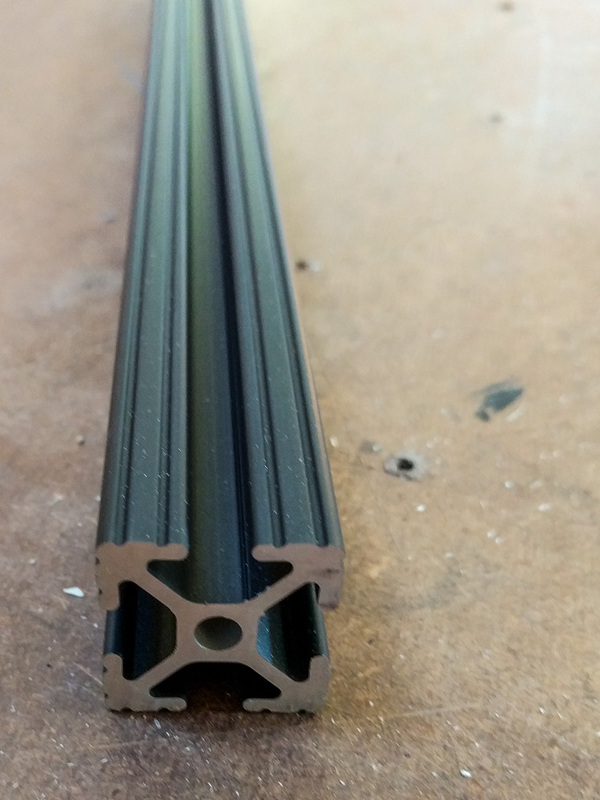 Even cutting the extrusions to length costs $1.95 per cut. For us, this was worth it because it gave us highly accurate pieces and Ikea-like simplicity in the assembly. This is a picture of the two ends of your piece of metal. This extrusion is the 1003, with three adjacent open slots. 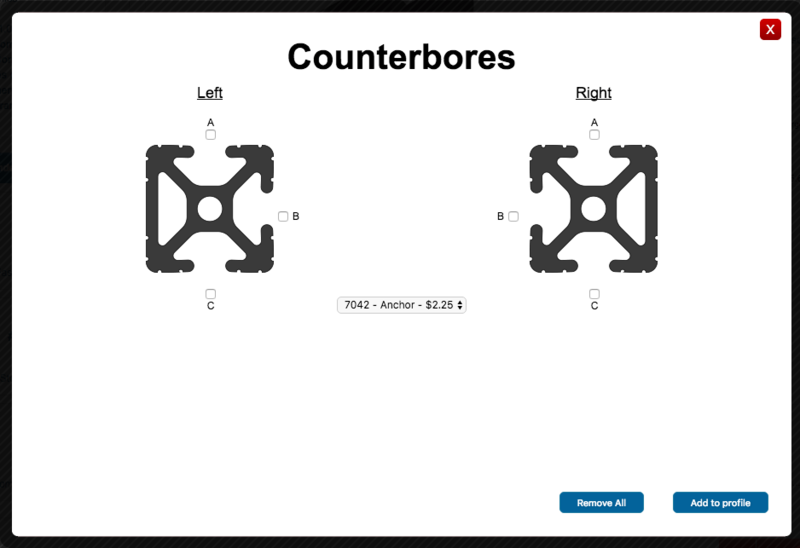 In the order list, you can see we noted that it needs counterbores on position “A” at both ends. You just check the box for A (twice) and add this to the profile. We didn’t actually buy our socket head screws from 80/20. We ordered in bulk from Amazon. 250 stainless screws cost us less than $15. Because we’ll be building more 80/20 stuff in the future it was worth it for us to get these. The socket head screws are for the corner connections that we used on the rear crosspieces. 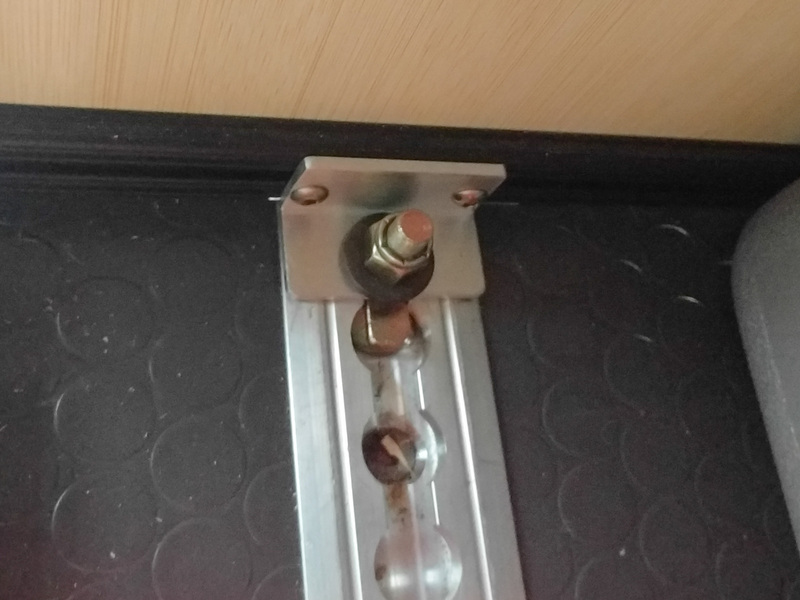 Rather than the expensive hidden anchors, we just used L-shaped connectors to hold the frames together at the back where nobody will see them. We also bought four of the same L-shaped connectors to clamp the countertop down to the top of the frame. Each L-shaped connector takes two socket head screws and two of the t-nuts. The t-nuts slide in to the t-slots in the frame pieces, then you tighten the screws down to hold the whole thing in place. Simple! A week or so after you place your order, you’ll get a package. Hopefully you already have a set of imperial size allen wrenches with ball ends, because you’ll need them to put all the screws together. The ball ends are pretty much essential so you can put the wrench in on an angle. Find the two uprights for the back. They are the long 1003 pieces (3 open faces). Lay them out with the closed faces to the edges, then put the two 14.5″ 1010 crosspieces at the top and the bottom to form a rectangle. 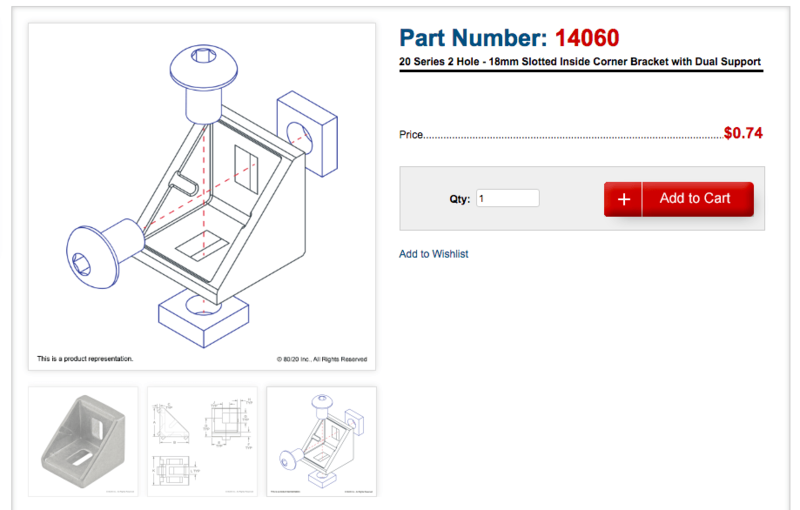 Use four of the 14060 inside corner brackets to attach the top and bottom pieces to the uprights. It’s easiest to loosely fit the screws and t-slot nuts on to the corner brackets, then slide the t-slot nut into the t-slots on the crosspieces and uprights before you tighten anything down. Find the two uprights for the front. They are the long 1002 pieces (2 open faces). 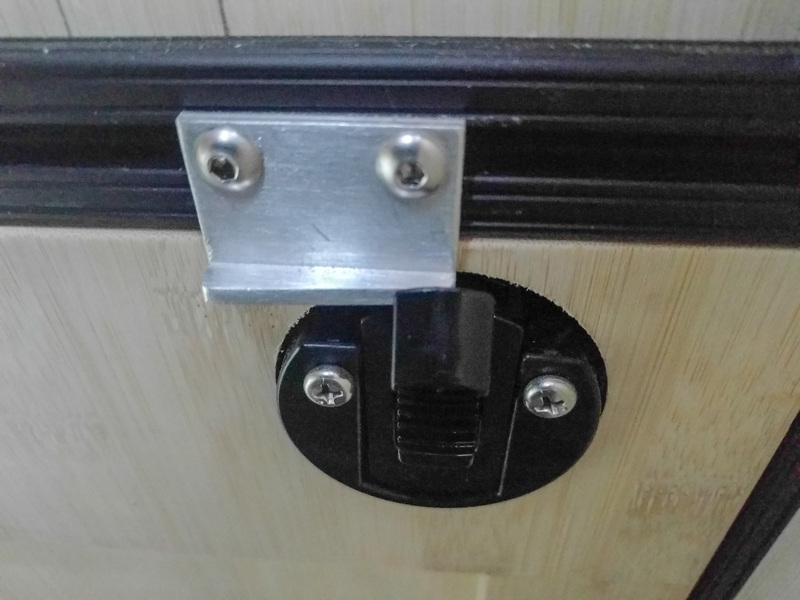 The two open faces obviously go to what will become the inside of the cabinet. Lay them out with the closed faces towards you and to the edges. Find the three 14.5″ crosspieces made of 1003, and six of the 3395 anchors. Slot the anchors into each end of the crosspieces. Now you know why you got 80/20 to drill those holes for you – they are in exactly the right place! Attach the crosspieces to the uprights with the closed face towards you (the “outside” of the cabinet). Slide the black ends of the anchors into the t-slots on the uprights. One crosspiece goes at the bottom of the front with the anchors pointing towards the floor. One goes near the top of the front with the anchors pointing downwards. The third goes at the very top of the front, with the anchors pointing upwards toward where the countertop will attach. Tighten the anchors with your allen wrench. Now you have a front and a back. Make a proper cabinet by adding the four 15.5″ long pieces of 1003 at the top and bottom of each side. Again, the closed faces point to the outsides of the cabinet, and the top anchors point up, the bottom anchors point down. This is so that you have clear slots all the way around for the wood panels to slide in. Simple, wasn’t it? Even if you got it wrong, no worries because it’s so easy to take apart and put back together again. We used 1/4″ thick bamboo ply for our panels. You have to cut the ply about 5/16″ larger than the opening on each side and on the top and the bottom. For instance, for the sides of the cabinet, the opening is 30″ tall and 15.5″ wide. So you need a 30+5/16+5/16 = 30-5/8″ high panel. It needs to be 15.5+5/16+5/16 = 16-1/8″ wide. You might want to cut the panels just slightly smaller than this to make them easier to insert, but remember you don’t want them to rattle around! It’s really easy to just take off the top extrusion from the sides and the front, slide the panel down into the slot, then put the extrusion back on again when you’re done. Depending upon the material you use for your panels, you might need to shim them on the back to stop them from rattling, or maybe use tiny dollops of silicone sealant inside the slot at various points to hold them in place. Be careful though; using the silicone means you’re gluing the pieces together and they won’t come apart so easily if you want to make changes later. You will need to work out how much overhang you want your countertop to have, and whether you want that overhang on both sides or not. Because we have another (removable) cabinet in the sliding door area, we didn’t put a countertop overhang on that side of the cabinet. We did put a 1/4″ overhang on the front and on the other side. Attach two of the corner brackets on the inside face of each of the two top side extrusions. The corner brackets come with little tabs to keep them centered in the slots, but we are using them turned through 90 degrees, so we need to grind those tabs off. The alternative is to either buy or make different brackets. The idea is to place the four brackets so that they provide four locations to screw through into the underside of the countertop. Assuming you’re using a countertop that can be screwed in to, tapped, or takes inserts, you now have a way to fix the countertop to the cabinet. Do make sure that your fixing points won’t get in the way of your sink or faucet installation. It might be best and easiest to create the holes for the sink and the faucet before you figure out the final locations for the brackets. With the sink hole cut, but before you install the sink itself, you’ll have plenty of access to see where each bracket should be located and to screw up through the brackets to hold the countertop in place. The sink we used is an Ambassador Marine Rectangular. It fits really well in this size sink cabinet. We also used their sink drain and strainer because it’s really compact. The faucet is also from Ambassador Marine. It’s their Aidack model. All of these pieces have worked really well for us. We had to drill the hole for the faucet very close to the rear of the countertop. 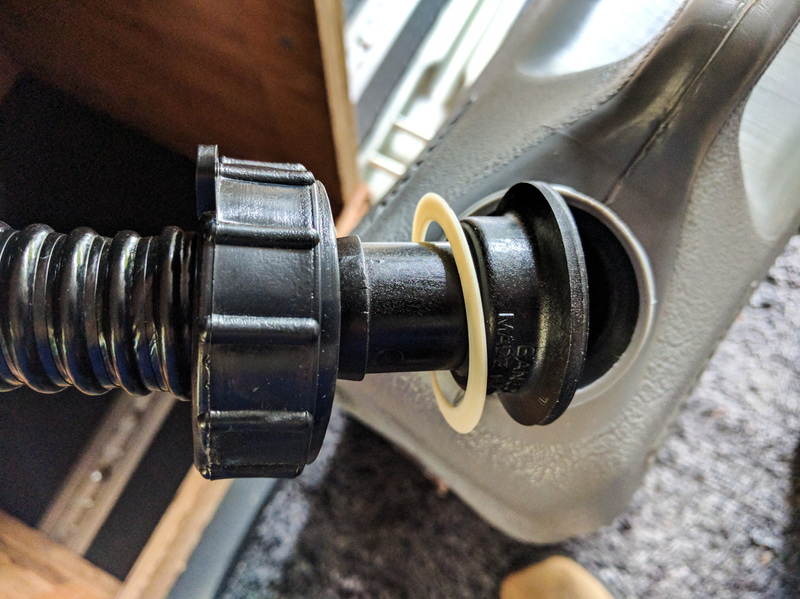 That meant that the hoses that come out of the bottom of the faucet would interfere with the top bar of the 80/20 on the rear of the cabinet. We moved the top bar at the rear of the cabinet down on our design. With the 80/20, that’s a really easy change to make. 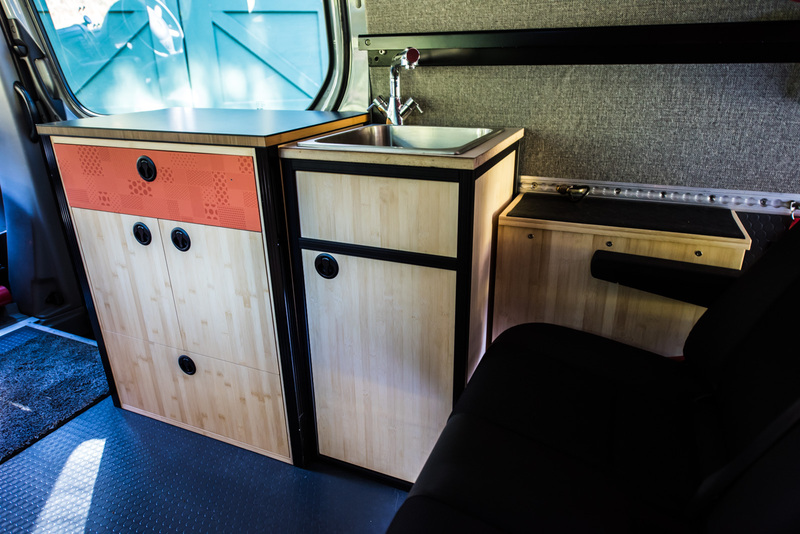 Our fresh water tank is elsewhere in the van, but we chose to use this sink cabinet as a space for our grey water tank. We wanted it to be inside the van because it’s not so likely to freeze. We also needed it to be portable. We chose to use 5 gallon jerry cans because they are easy to lift out and empty. This particular version *just* fits in under the sink with the 1/4″ panels in place. We strapped the tank in place with some webbing to stop it from rattling around. The sink drains directly in to a jerry can via the screw-on lid. When a can gets full, we just unscrew the lid and move it to the other can. The loop in the hose acts as a trap to stop smells from coming back up the drain. We don’t have a vent, but the water doesn’t bubble at all when it pours out of the sink. There is plenty of space for two of these cans under the sink, so it would be easy to use one for fresh water and one for grey. A small 12v pump to get the water to the faucet would fit in as well if you needed it to. We built a door for the cabinet using three layers of bamboo ply. The back two layers are just a frame around the edge, glued to the front layer. That makes the door 3/4″ thick. Because the door is inset into the frame of the cabinet, it needs hinges that will attach to the side panel. We used some hinges very much like these Blum inset hinges. We glued some additional 6″x6″ squares of plywood on to the side panel in the locations where the hinges needed to attach. We used one 1/8″ layer, then one 1/4″ layer. That built the side panel up to the same level as the 80/20 frame. In the picture above, you can see how the hinge attaches to the side panel (left) and to the door (right). We made it so that the back face of the door is level with the back face of the frame. That makes the front face of the door inset 1/4″ from the front of the frame. The door just covers the slots in the frame when it’s closed. 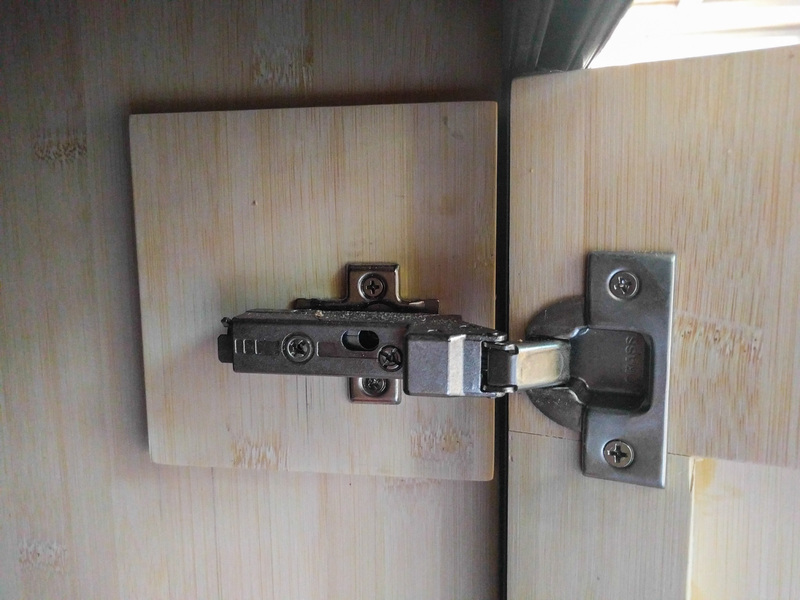 The latch we used is a Sugatsune LJ-61 flush slam latch. We have these on all the other cabinets, so it made sense to use it here too. Check prices elsewhere if you want to use the same one – for instance ATGstores.com has a much better price sometimes. Making a hole for this in the door was interesting. First, we had to measure *very* carefully. Then, we drilled in from the back with a 2-1/4″ hole saw to the correct depth for the backing plate to attach. Then, we turned the door over and drilled in from the front with a 2″ Forstner bit to complete the hole at the correct diameter for the latch itself. The catch that comes with this latch won’t work in this situation, but it’s really easy to make your own from a piece of 1/8″ aluminum angle. Here’s how ours looks. You can slide it from left to right to adjust the catch point, and it also doubles as a door stop so that the door doesn’t close too far into the cupboard space. Remember to order two more socket cap screws and t-nuts if you’re going to use this style of catch. We have l-track on the floor and wall of our van, so we just built brackets out of 1/8″ aluminum angle to clip the 80/20 to the l-track. It’s pretty easy to think of many different ways to attach this stuff to your van depending on what surfaces you have. Rivnuts, l-track, or just screws into the floor and wall would all do the trick. Just remember to buy extra screws and t-nuts for each bracket you want to add. If you forgot at the time, Amazon carries them as well. The cabinet is really lightweight, sturdy, looks good, has tons of storage space for its size, and still allows three people to sit on the bench seat. Better still, it’s totally removable because we attached it to our l-track. That lets us change our configuration whenever we want. Thank you for this post! Very thoroughly laid out and organized instructions. Need to order the sink now, it looks like yours is 14x14x9? That’s a spendy bowl! Yeah – we started with an Ikea sink (Fyndig) which was only $30. But it’s a little too large. You might be able to find a suitable one at Home Depot. Prices vary wildly without necessarily any difference in quality. The Ambassador Marine one isn’t even remarkably high quality. We got ours as an Amazon Warehouse deal (click the “used” link in the listing if there are any) so it was quite a lot cheaper. We used the 14.5×14.5×6″ version. It has a 3/4″ lip all the way around, so the bowl itself is 13″x13″. The 9″ may be too deep to use comfortably. Good luck in your sink search. Hey I just wanted to thank you for your awesome website and contributions to the sprinter forum. 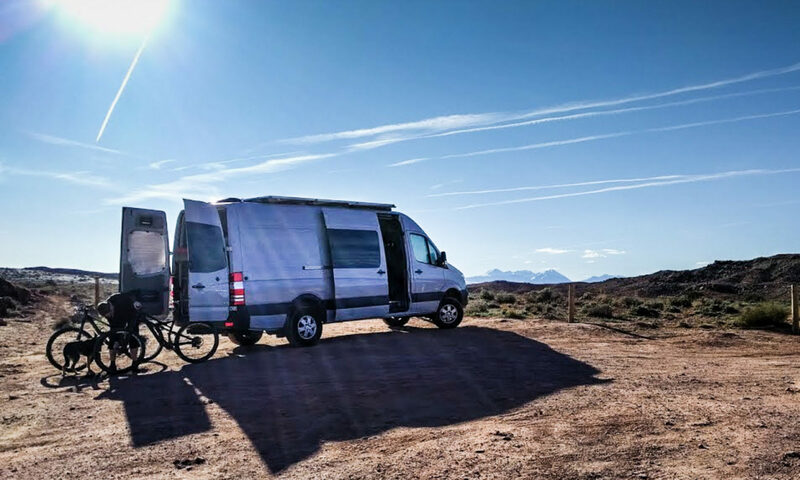 We just sold our Ford E-350 DIY conversion and found a good deal on a partially converted used 2014 170 2500 and have been converting it in to a bike/surf/adventure van (RadVan!). We slammed in the minimum for a 3.5 week epic Western Colorado MTB trip, now slowing down and getting the details right. I’ve gotten lots of ideas and great Amazon links from your website (especially L-Track, which we are using liberally throughout the van). If you get bored, I wonder if you could post up some more detail pics of how you mounted your compressor and tank. Would love to be able to pop tubeless beads from the van and blow off powdery dust after some rides. Wondering how it’s worked so far. Also, I am really interested in the hot water system, and how it’s worked so far. We have the Base Camp BOSS portable shower system which has been awesome so far (scalding showers! 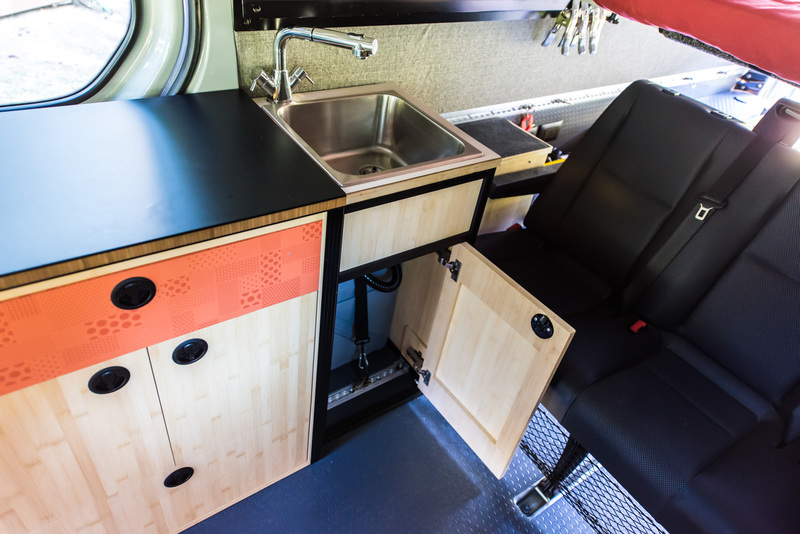 ), but would love to have hot water inside the van as well. Hey Sandor – I saw your trip photos on the Sprinter forum. Looks like you had a great time! The air compressor is great for tubeless tires. We do use it to blow dust off the bikes, and also to blow out the interior of the van. I’ll do a post on the install with some more detail and some more pictures. Might take a week or two, though. We also love our hot water system. The Indel hot water tank stores the water at a really high temperature, but then there’s a tempering valve on the outside of the tank that mixes in the correct amount of cold water. That means we get way more than 4 gallons of hot water from the 4 gallon tank. The only thing I think we’d do differently is install a larger cold and larger hot tank. No space in our build, though! Just a heads-up with the 2500 170: You have a much lower weight limit to work with than the other van types. Your payload is around 2,500 lbs, compared to 3,500 for the 144″ wheelbase van and 4,500 for the dually 3500. We’ve run into that a couple of times. Be sure to pick light weight options wherever you can. That’s one reason we used 80/20 for the sink cabinet, and plan on replacing our other cabinets with it as well. Good luck with the rest of the build, and stay tuned for more information on the air system and hot water. Any issue with the van > l track > 80/20 thernally conducting? I have read elsewhere that its better to thermally isolate the 80/20 from the van. Did you do anything like that? Thanks! I’m sure there’s some truth in the thermal isolation argument, but in reality it doesn’t make any difference as far as we can tell. If the van is cold, all the metal inside it is cold. If we’ve heated the van up, all the metal inside it ends up at the same temperature (give or take). Nothing seems to radiate cold into the van. True thermal isolation would be really difficult to achieve without using bolts that don’t conduct heat. If you wanted to, you could use some wide plastic washers between the 80/20 and the L-track, and then a plastic sleeve around the fixing bolt you use to attach the two. That seems like overkill to me though. The cabinets look great, thanks for the detailed write up. Was the bamboo 1 or 3 ply and where did you buy it? Bob, we used Teragren 3-ply bamboo sheets. Plyboo is another manufacturer. The sheets are hard to find. My neighbor has an account with a specialty supplier.